Hats and Rabbits: All About The Swagger? An interesting experience, today, talking with a classroom full of high school seniors: As we wind down the year of my "College Writing" class, I tend to get into "real life" writing tasks. This is both my chance to prove to them the writing will be part of their lives beyond college and to hand them a few pointers on resumes, e-mails, cover letters, etc. The general lesson, of course, is that all of these tasks call for "clarity, brevity and precision" in their work. Same skills, different tasks. One of the topics we covered was tone. A student asked how one can sound confident without sounding egotistical. He is a bit of a rare bird among the young flock even to have asked this question and you could see some quizzical expressions around the room. In the culture that surrounds these young people, they are bombarded with bragging. 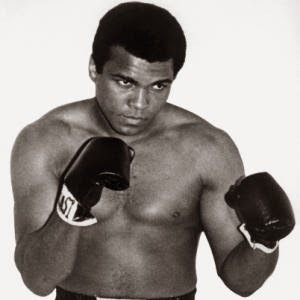 Muhammad Ali opened a real can of worms when he shocked everyone by announcing, "I am the greatest! I said that before I even knew I was." It was cool, then -- it was pleasingly cocky. But now, it is pretty common. So, some of these kids didn't really know what their fellow student meant. They were confused. Sincerely, so. They were baffled. "Self-confidence is all about the swagger, right?" their eyes seemed to ask me. But it is interesting. These guys are bombarded daily with media-driven behavior traits. There is no agenda behind it; it is not a conspiracy to corrupt our kids or to draw them away from good old-fashioned values. It is more like a spreading sickness, really. Each exposure leaves kids more and more contaminated with examples of cockiness and egotism, expressed without shame or remorse. How are they supposed to react? It's the norm. If parents want kids to be even remotely humble, it is going to have to be handled at home and parents are going to have to point it out: "Look how arrogant that guy/girl is." Otherwise, it will just seep in... Actually, it may seep in regardless of our attempts. It's a heck of a tide to fight.